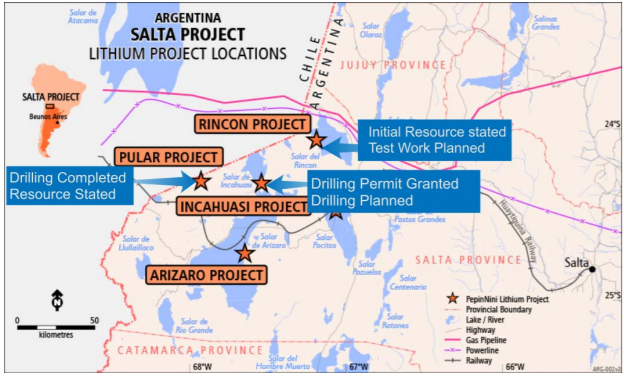 PepinNini Lithium Ltd’s (ASX:PNN) PepinNini SA has been granted a drilling permit in respect of Mina Sisifo, Incahuasi Salar by the Mining Court of Salta Province. 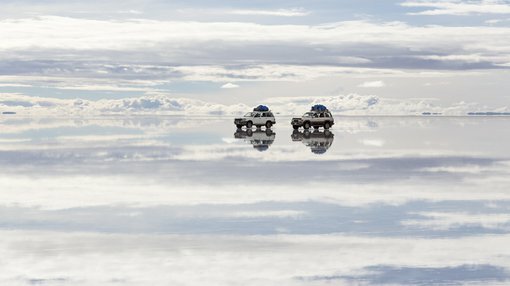 This entitles the company to explore the salar using geophysics, drilling, trenching and sampling. PNN plans exploration drilling, targeting a Lithium Carbonate (LCE) resource on the salar which is located midway between the company’s Rincon and Pular Projects as indicated below. 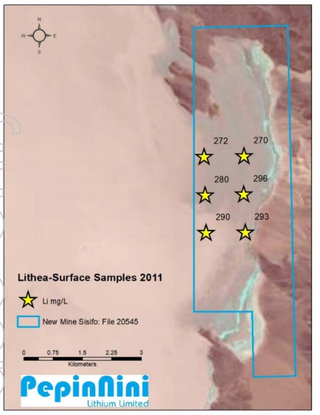 Mina Sisifo was granted to PepinNini following a tenement swap earlier this year with Lithea Inc, wholly owned by Canadian entity Lithium S (TSX.V:LSC) which involved the direct swap of Lithea’s tenements on Salinas de Incahuasi for tenure at Salinas Grandes held by PNN. Data obtained from the previous holding entity indicates surface lithium grades up to 296mg/l and chemistry showing elevated calcium as indicated below. This factor would reduce the lime (calcium carbonate) requirement for processing to LCE, potentially making this an excellent brine for blending. Lime is used in processing to remove impurities such as magnesium. The unique chemistry of Incahuasi Brine makes this project very attractive to play an integrating role in the development of the company’s three lithium brine projects in Salta. It is also worth noting that this is the last salar in Salta Province without a defined LCE resource and there are only three entities holding tenure in the Salar, PepinNini, Advantage Lithium (TSX-V:AAL) and the Provincial Authority REMSA, with the latter expected to release areas for public competitive tender towards the end of year.